Commentator Ben Mattlin never looks forward to Halloween. He says having a highly visible disability can make the holiday feel odd and unsettling. I never thought about a connection between disabilities and Halloween until I learned of the once-common fear of deformities — the limping, hunchbacked, hook-handed or one-eyed monsters of ancient fairy tales and old horror movies. Even the word "creepy" comes from the same word as the oldest term for folks like me, the politically incorrect "cripple." As a kid, I tried not to think about what people might make of me, sitting in a wheelchair in my Batman or Lone Ranger costume. A hero who can't walk? Why not? Halloween is a celebration of the imagination, after all. Sure, some kids teased. But I often scored more candy than my brother, who is not disabled. I saw no reason to complain about being treated differently. Yet as an adult, I began to feel uneasy about the creepy exhibitionism of Halloween, the way it encourages staring at all things weird. I can't help wondering if Halloween doesn't promote ridiculing differences — even a kind of conformity. Yes, I know, for most people Halloween is an escape from conformity, but for those of us who don't quite fit the norm, that's nothing special. In fact, demonstrating that you're not exactly what people expect is pretty much what disabled folks do every day. When I take my own kids — who do not have disabilities — trick-or-treating, I often attract as much attention as they do. It's not the same in daylight. When kids see me on the street, careering in my power wheelchair, they often say things like, "Wow! Can I have one of those?" Hey, my chair is an amazing, transformative device. "Cool, isn't it?" I'll say back. I figure I should do my part to make kids comfortable with people like me. Sometimes I have to tell the adult with them that it's OK, that kids shouldn't be forced to look away. I encourage them to ask questions, to learn. Maybe I should see Halloween as an opportunity for grown-ups to do that, too. The holiday challenges us to stretch our perceptions. Maybe it can also teach us not to shrink away from the unfamiliar or judge appearances. This Halloween, I'll try to remember that I really have nothing to fear. Owen Cain (pictured)depends on a respirator and struggles to make even the slightest movements — he has had a debilitating motor-neuron disease since infancy. 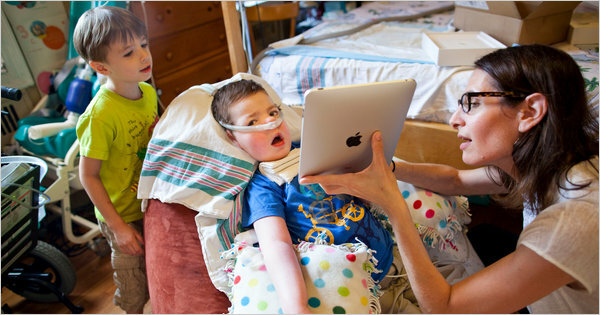 Since its debut in April, the iPad has become a popular therapeutic tool for people with disabilities of all kinds, though no one keeps track of how many are used this way, and studies are just getting under way to test its effectiveness, which varies widely depending on diagnosis. A speech pathologist at Walter Reed Army Medical Center uses text-to-speech applications to give patients a voice. Christopher Bulger, a 16-year-old in Chicago who injured his spine in a car accident, used an iPad to surf the Internet during the early stages of his rehabilitation, when his hands were clenched into fists. “It was nice because you progressed from the knuckle to the finger to using more than one knuckle on the screen,” he said. Parents of autistic children are using applications to teach them basic skills, like brushing teeth and communicating better. For a mainstream technological device like the iPad to have been instantly embraced by the disabled is unusual. It is far more common for items designed for disabled people to be adapted for general use, like closed-captioning on televisions in gyms or GPS devices in cars that announce directions. Also, most mainstream devices do not come with built-ins like the iPad’s closed-captioning, magnification and audible readout functions — which were intended to keep it simple for all users, but also help disabled people. “Making things less complicated can actually make a lot of money,” said Gregg C. Vanderheiden, an engineering professor at the University of Wisconsin at Madison who has worked on accessibility issues for decades. The iPad is also, generally speaking, less expensive than computers and other gadgets specifically designed to help disabled people speak, read or write. While insurers usually do not cover the cost of mobile devices like the iPad because they are not medical equipment, in some cases they will pay for the applications that run on them. Still, Ms. Hyatt said that when she was having trouble chatting with friends at a bar recently, she pulled out her iPad to help communicate and felt normal. “People were drawn to it because it was a ‘recognized’ or ‘known’ piece of technology,” she wrote in a blog post reviewing the device. At the Shepherd Center, a spinal cord rehabilitation clinic in Atlanta, some teenage quadriplegics have received iPads as gifts, but they do not work well for those who rely on a mouse stick — basically a long pen controlled by mouth. Owen will turn 8 on Nov. 11. While his condition is not expected to worsen, he is extremely sensitive to infection and once nearly died of pneumonia; three specialized therapists and a nurse help keep him alive. Though he cannot speak, his parents have taught him to read, write and do math. He has an impish sense of humor and a love of “Star Wars.” “He’s a normal child trapped in a not normal body,” said his father, Hamilton Cain, 45, a book editor. A statue that depicts one of America’s most charismatic presidents, Franklin D. Roosevelt, was sculpted to show him in a way he wanted to be seen — able-bodied. But the man who led the United States out of the Great Depression and through World War II was partially crippled from polio. In today’s world, a politician with a disability can be perceived positively by constituents, disability advocate Elanah Sherman, of Norwich, said. This dynamic is unfolding in Connecticut, where Democratic gubernatorial candidate Dan Malloy (pictured left), who has dyslexia, and Republican candidate Tom Foley (pictured right), who has Bell’s palsy, are in a tight race. “Now, it’s more an emblem of pride than an emblem of stigma,” Sherman said. Some might say this points to dramatic change, but, rather, it is a softening of a harsh landscape for the disabled that has come with time and hard work. help de-stigmatize the disabled. If either Foley or Malloy is elected, it will be the first time Connecticut will have a governor who has acknowledged a disability or condition that sets them apart. Independent Thomas E. Marsh also is on the gubernatorial ballot. Malloy, the former mayor of Stamford, graduated with a law degree from Boston College. When he was a child, his parents were told not to expect much from him, he said, and even labeled him mentally retarded. Today, Malloy often talks to parents and children about his disability. “It would have an effect on the process of education, because it would increase awareness of capacity. And it would decrease damaging and limiting assumptions based on peoples’ diagnoses,” Sherman said. But whether funding would be affected is another question. Gov. M. Jodi Rell has asked all state agencies to look to cut their budgets by 15 percent — the state is facing a $3.5 billion deficit. Both candidates assert they would not compromise the safety net in place for the state’s most needy citizens. “Growing up with a physical and learning disability is part of who I am,” Malloy said. “It formed me as a person; in some sense it’s reflected in the person I am. I love to work; I love to work hard. I think I express an empathy and compassion for people down on their luck, suffering from mental illness, or circumstances beyond their control. Foley is quick to point out he does not consider his Bell’s palsy a disability. But he said it has increased his awareness of how a disability can affect a person. “I don’t want people thinking I’m thinking I’m disabled. Because that would be insensitive to people with real disabilities,” Foley said. But while on the campaign trail, Foley discovered a need to explain that his stoic facial expression did not convey a lack of empathy or emotion but was because of Bell’s palsy. It affects the nerve muscles in the face, causing a lack of movement and symmetry. Beyond that, the flatness in his face sometimes would be perceived as a frown, he said. “People can sometimes read it as stern or detached,” Foley said. Foley was diagnosed with Bell’s palsy in 1994, but he said his empathy for people with disabilities does not stem from that, but from being the primary person in charge of caring for his sister, who has bipolar disorder. “I have said that I’ve made the commitment that I’m not going to reduce on the backs of the most needy — the disabled, the poor, the elderly. We need to continue to have high-quality service. I’m not talking to reduce that. You simply can’t do that,” Foley said. Having a governor empathetic to the disabled could translate to an awareness of the lives that are in his safekeeping, Ferry said. “The other hope is that the needs of kids will be more visible to him instead of being just a number on a large state spreadsheet,” she said. About 10,000 disabled people rallied in Tokyo's Hibiya on Oct. 29, calling for new support measures. The participants gathered from across the nation at the Hibiya Open-Air Concert Hall in Chiyoda Ward before taking to the streets calling for measures to replace the notorious Services and Support for Persons with Disabilities Act, which was criticized for increasing the financial burden on the disabled. "In considering new comprehensive welfare legislation, we need to secure transparency, fairness and financial resources," said Mitsunori Okamoto, parliamentary secretary to the Health, Labor and Welfare Ministry, as he addressed the rally. "We want every disabled person to be assured of the right to live in their local community without discrimination," a visually-impaired participant said as a representative of the attendants. Every Tuesday, Jennifer Wilkerson helps "Scrappin in the City" open up shop. "She vacuums. She dusts. She mops," says Yvette Morris, Co-Owner of "Scrappin In The City." Not only is she a real go getter, Jennifer is perhaps the store's most pleasant employee. "Just a week ago, she started giggling and laughing," says Sarah Preston, Co-Owner of "Scrappin In The City." Jennifer is autistic. Thanks to a program called Breakthrough Knoxville, she landed a job at "Scrappin In The City" back in August. "Breakthrough by design is to help improve the lives of adults with Autism," says William Brown with Breakthrough Knoxville. "That's our motto." Breakthrough partners with local business to help autistic adults transition into the workplace. "They're adults," says Brown. "They need to be out in the community, and by working, it's kind of the last real element of the greater community." For Jennifer and other Breakthrough participants, it's a learning process and a chance for mental, physical and social growth. "If you had seen her the first day she came in, she wanted to sit in the chair by the door and just watch us," says Morris. "She didn't do stairs and had trouble going over the walkway." Now, Jennifer is busy cleaning upstairs and downstairs. "She's got it down," says Brown. "And, in some cases, she has changed her routine. She's taken ownership of it." "It's incredible the difference in just a few months," says Morris. "She'll be taking care of the whole store soon." Two other Breakthrough participants are employed at Walgreens and Quizno's. A North Vancouver father expressed disappointment with a 2-1 Court of Appeal ruling Oct. 29 that blocked his bid to force the school system to accommodate learning-disabled students. But Rick Moore said he hopes to take the case to the nation's highest court in Ottawa. "My hope is that we continue," he said Friday, minutes after the ruling, which upheld a lower court decision. "I'd like to go to the Supreme Court of Canada. I'd like it to be a national precedent." Moore said it was frustrating because he began his challenge of the school system 13 years ago when his son Jeff, who has dyslexia, was in elementary school. Now 23, Jeff is a union plumber who is able to read because, Moore says, he and his wife pulled their son out of Braemar elementary in North Vancouver when he was in Grade 3 and the school had not yet taught him to read. The parents, who have modest incomes, put Jeff in a private school known for helping kids with learning disabilities. "It was never about Jeff," Moore explained in an interview. "He got the right kind of schooling and achieved his potential." He did it for other families with learning-disabled kids who are not getting the proper help in the school system, he added. "They have been waiting decades," he said. "There have been a lot of hollow promises over the years." Moore said he was surprised when the premier outlined in his televised public address this week that the province will do more to help remediate students in need, promising every Grade 4 student would be reading, writing and doing math at a Grade 4 level within five years. "I almost fell off my chair when I heard the premier talking about it," he said. In 2005, Moore won his B.C. Human Rights Tribunal complaint. The tribunal found that the North Vancouver school district discriminated against Jeff and other severely learning-disabled students by failing to accommodate their disabilities. The Ministry of Education and the school district appealed the finding to the B.C. Supreme Court, arguing the tribunal made errors in law when it sided with Moore. The trial court quashed the tribunal's decision, ruling the tribunal had erred in finding discrimination in the absence of evidence of disparate treatment. In a split ruling Friday, three judges of the B.C. Court of Appeal upheld the B.C. Supreme Court decision. "This case is not concerned with reviewing what services the government should have provided to most effectively deal with Jeffrey Moore's disability," said the written judgment by Appeal Court Justice Richard Low. The judge found the proper question is not what a public school system should provide, which is a matter for Parliament and the legislature, but rather whether the failure to fund certain services amounted to an unequal and discriminatory denial of benefits. "I do not think there is any basis for a finding of discrimination against the province in the absence of such finding against the school board," the majority ruling concluded. In dissenting reasons, Appeal Court Justice Anne Rowles decided to reverse the lower court ruling that quashed the tribunal finding. "In my opinion, the 'service' in issue is general education and not special education as found by the reviewing judge," the judge said. "Reading is part of the core curriculum and is essential to learning. The accommodation sought by Jeffrey and other SLD students ... is not an extra 'ancillary' service; instead it is the way by which meaningful access to the service can be achieved," Rowles concluded. The full decision is available online: http://www.courts.gov.bc.ca/jdb-txt/CA/10/04/2010BCCA0478cor1.htm. HAYWARD, Calif. -- BART saw significant delays Saturday after a wheelchair-bound passenger ended up on the trackway of the Fremont line and was hit by a train. The incident occurred at 2:50 p.m. just south of the Hayward BART station. The passenger was reportedly at the station, which is on a platform, and it was unclear how he/she ended up on the tracks. The victim was removed from under the train a little after 3:10 p.m. and reported to be alive, according to BART spokesperson Linton Johnson. Train service was temporarily shut down after the accident occurred, but at 3:17 p.m., service re-started, Johnson said. At 4:15 p.m., service was fully restored. From USA Today. In the picture, Army Spc. Daus Hempker, 22, Lima, Ohio, right, goes through an exam with Navy Capt. Michael Wagner, a neurologist and the traumatic brain injury director at the Kandahar Air Field Role 3 Medical Treatment Facility. KANDAHAR AIR BASE, Afghanistan — Military doctors are diagnosing hundreds of concussions among combat troops because of an unprecedented order requiring them to leave the battlefield for 24 hours after being exposed to a blast. Doctors say the order helps prevent permanent brain damage that can result if a service member has a second concussion before the first one heals. "For the last eight years prior to the implementation of these protocols, we weren't doing things the right way," said Gen. Peter Chiarelli, the Army vice chief of staff. Concussions among U.S. troops in Afghanistan increased from 62 diagnosed cases in June to 370 in July when the new rules were imposed, according to the U.S. Central Command, which oversees combat here. 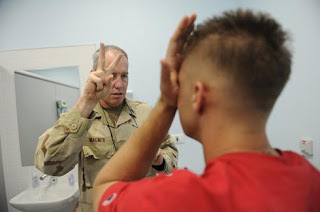 "I'm certainly never happy to see the rate of any wound increase, (but) I think the data clearly demonstrates that TBI (traumatic brain injury) is getting the attention it deserves," says Adm. Michael Mullen, chairman of the Joint Chiefs of Staff, who pushed for the new rules. "Battlefield leaders are taking the issue seriously and getting their troops the help they need." Symptoms include brief loss of consciousness, clouded thinking, dizziness and headaches. Ninety percent recover from their symptoms and return to combat, although this can take days or weeks. The data show that concussions may be far more common in combat than previously known and may suggest that thousands of these casualties may have been missed earlier in the Iraq and Afghanistan wars, Mullen says. Roadside bombs are the most common source of injuries to U.S. troops. Troops in the past tended to shake off blast effects and continue fighting, according to Army field studies. To treat symptoms of concussions, the military has set up five "rest centers" here where troops can recover, says Army Lt. Col. Kristofer Radcliffe, a neurologist supervising the effort. Scientists warn, however, that it is unclear whether the brain has healed even if symptoms go away. "Unfortunately, we still don't know," says Ibolja Cernak, a brain-injury scientist at Johns Hopkins University Applied Physics Laboratory. Others worry that the policy could leave too few troops for combat. "You want to look out for the welfare of your men and women. At the same time, you want to win the fight," says David Reist, a retired Marine Corps brigadier general who fought in Iraq. "Those two things are diametrically opposed sometimes." They live among us but are rarely seen in public, perhaps because they face harsh stares whenever they venture outdoors. Shopping for clothes is an embarrassment, using public transport is difficult and marriage is an improbable dream. They are not disfigured. They are dwarves. But since Tunisia's "little people" do not qualify as "disabled", they receive no government help. They have no option other than to fend for themselves. Soumaya Salmi, 37, is unmarried. She was told by a potential suitor that things would have been different had she been of average stature. "Even my mother prefers my normal-sized siblings," she tells Magharebia. What hurts the most, however, is her inability to find work. She has a degree in IT and is good in languages, but has been unable to find a job for 12 years. No one wanted to hire a dwarf. Little people never hold important positions, she complains. Short people are always associated with small jobs, such as waiters, street vendors or beggars. She calls for awareness campaigns to educate Tunisians about dwarves, as well as an association to support their social, psychological and health needs. "Tall or short stature, they are gifts from God, which He gives to whom He wills, but each of us has a mind to think," Salmi says. A private association would indeed help the dwarf population, said Achour Aouadi, Secretary-General of the Tunisian Association of Social Affairs. He agrees that dwarves are marginalised and suffer from a lack of integration and support. "They are capable of success, especially in the field of cinema and theatre," he noted. They should be able to find employment in areas other than the circus, officials suggest. According to Social Affairs Ministry official Ahmad Balaazi, there is no discrimination between tall and short persons in the allocation of public jobs, he said, adding that employment is open to the public and opportunities are granted equally. "The important thing is that they work like the rest of the members of the community and provide for their daily needs," Balaazi told Magharebia. Tunisian law defines a disabled person as anyone with a "permanent lack of physical, mental or sensory capacities and qualifications… which limits his/her ability of performing one or more daily personal and social activities, and reduces his chances of re-integration into the community". Dwarves argue that their social integration is indeed severely "reduced". The government sees it differently. "They are able to fend for themselves and live a normal life, and size does not constitute any obstacle for them to work or to move or do anything," the ministry official added. Those people who find themselves unable to care for themselves, Balaazi said, should contact the offices of the Ministry of Social Affairs, which are available in each province. The process did not work out as Balaazi described for Mohamed Barhoumi, a 46-year-old dwarf. He contacted numerous offices to request facilities and exemptions for persons with disabilities, but his attempts have not yielded any results. "My work requires me to commute, but my height is an obstacle to using public transportation," he tells Magharebia. "I am forced to use taxis, but they often ignore me." "The taxi drivers think I am a child," he explains. He knows other dwarves who suffer from poverty and isolation. Psychological stress can also arise from things that average-sized people take for granted. People should keep dwarves in mind, Barhoumi says, when they build stairs, sidewalks and kerbs, as well as when they sell clothes and shoes. "It's embarrassing and sad to have to go to shops meant for small children," he tells Magharebia. Belgacem Briki (pictured) is 59. His education ended in primary school because his peers ostracised him because of his size: "You are not like us, then you are not one of us". The embarrassment he suffered since childhood, compounded by cruel treatment from his classmates, put an early end to his education. His family's poverty finally spurred him to look for a job. "There is no escape from the streets and who's on it, but I have to deal with the consequences," he says. He soon discovered that finding work was not an easy task. Everyone looked at him with cynicism. Because of his diminutive physique, he says, he was perceived as an incapable person who could not provide a useful service. "Unfortunately, Tunisian society still links short stature to limitations and weaknesses," Briki laments. But the rejections he received from potential employers only made him more determined. Luck finally smiled at him. 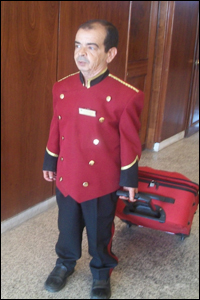 He found a job in a Tunis hotel. He considers work as an opportunity to rely on himself, break the negative stereotype imposed on dwarves and prove his worth as an effective member of the community. A lifetime of suffering rejection and intolerance may even have helped him to be better at his job. One of his managers, Mehrez Rajhi, described him as "very kind". "He knows how to deal with customers with respect and affection, which makes him succeed in his work and prove that he is worth it," Rajhi said. Briki was able to change his weakness to strength. He no longer feels unable or inferior, especially after he got married and was blessed with children. "For me, short stature does not represent an obstacle but an incentive to withstand it, because without perseverance we cannot reach what we want, regardless of the difference in size or shape". Regional gardener of the year Graham Burtenshaw (pictured) knows every last inch of his patch intimately, despite never laying his eyes on it. The Picton man lost both his eyes in a horrific go-carting accident 15 years ago and everyone expected him to give up on his pastime. "Really from then onwards it's just been a different life, but it's been happy and creative," he told Close Up. Frustration, he said, would be the biggest enemy for a person in his position. "I really can say I don't get frustrated very often, it's a real blessing." 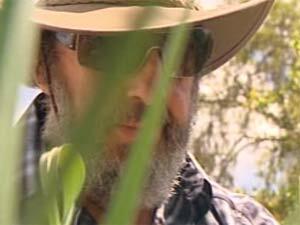 The 67-year-old has been a keen gardener his whole life and refused to give up on it. He now produces much more from the garden than he ever did. He built all the paths in his garden, as well as the raised beds. And he does all the planting and weeding. His best crops are silverbeet and broccoli, and he says his secret is making all his own organic compost, fertiliser, and insect spray. After a few little mishaps such as the accidental weeding of his wife's flowers, there is only one rule Burtenshaw follows religiously. He now puts stakes around anything that is not a weed, and he has also studied leaf shapes so he can differentiate between plants. "A cabbage leaf is fully round and a broccoli leaf is pear shaped with notches in it and the cauliflower is a pear shape with no notches," he explains. The former boat builder and carpenter says the only thing he misses now is scuba diving, and being able to see his grandchildren. Otherwise he just carries on as normal, doing all the odd jobs around the house from painting the roof to tiling the conservatory. His wife Margaret says his attitude is admirable. "He accepted things so well and wasn't depressed and wasn't saying 'poor me' in any way or form - that made it a lot easier for me as well." Burtenshaw has also had to find new ways of earning an income, so he mortgaged his house to buy a guitar, amplifier and microphone, and started busking. "The Bank of New Zealand both in Blenheim and Picton both give permission to busk outside there and it's right good because you're right beside an ATM machine," he said. Burtenshaw often finds himself with an oversupply of vegetables, and with three of his four children living out of the region, he is very popular with the neighbours. 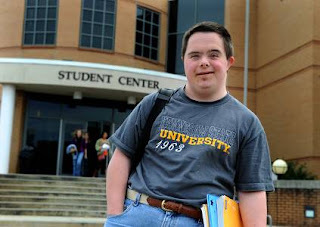 KENNESAW, Ga. -- Christopher Hunnicutt (pictured) slowly made his way across the Kennesaw State University campus from his music appreciation class to the student center, waving and smiling to everyone he encountered. "Hey, I'm Chris," he said with a raspy voice and big grin to a taller but younger student also going his way. Christopher extended his hand for a solid handshake. "Glad to know you, Chris," the other student replied. They chatted along the way as Chris exchanged more waves and smiles to dozens of students walking past. Some engaged the stocky young man in pleasant conversation: "Hey man, how're ya doin'? How're your classes?" Others simply responded with an encouraging smile. Students or staff, it made no difference. Christopher wanted to meet everyone as he basked in his college experience. He was beyond ecstatic just to be on campus; thrilled to be, in his words, "just a typical student." It's impossible not to smile when meeting Christopher Hunnicutt. The other students might not know who he is unless they shared a class, but they know at first glance that there's something different about him. 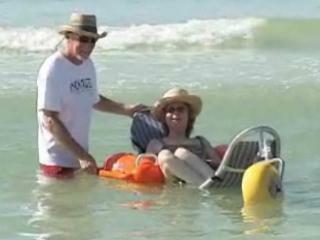 SARASOTA, Fla. -- For many beachgoers a trip to the sandy shores includes a stroll on the sand and a dip in the water, but if you use a wheelchair your beach experience usually ends in the sand. Not anymore for those visiting the Sarasota, Florida, area. Sarasota County's Parks and Recreation Department has purchased several Mobi-Chairs that can glide across the sand and float in the water. Member's of Sarasota County's Therapeutic Recreation Coalition were the first to try out the floating wheelchairs. Their patients game them rave reviews. A total of ten chairs were purchased by the county. Three New Hampshire hospitals, including two in Nashua, have agreed in the last three months that they would improve interpretation services after being accused of failing to communicate properly with deaf people. The agreements were reached with the U.S. attorney’s office, which landed a similar settlement with a fourth hospital two years ago. On Oct. 29, federal prosecutors announced the town of Wolfeboro would improve several of its facilities after a complaint that they weren’t accessible to people with disabilities. The timing of the settlements may suggest the makings of a trend, but Assistant U.S. Attorney John Farley said it’s a coincidence. “The investigations have been going on a long time,” Farley said. “Some of them happened to wrap up in close proximity of one another. The string of announcements also doesn’t necessarily mean the U.S. attorney’s office has only recently pursued possible American Disability Act violations, he said. The office takes the matter seriously, and has reached other settlements in the past that probably didn’t receive as much media attention, he said. The complaints were unrelated, Farley said, but carried the same charge: People were denied service or medical treatment because their disabilities weren’t considered. A concerned resident filed the complaint against the town of Wolfeboro, the U.S. attorney’s office said. On Friday, the town agreed to make a number of changes to improve parking areas, sidewalks, restrooms and other features at town facilities so they’ll be accessible to individuals with disabilities. On Monday, Frisbie Memorial Hospital in Rochester agreed it would better determine the needs of deaf and hard-of-hearing individuals and then provide them with appropriate auxiliary aids and services, including American Sign Language interpreters. The two complainants will also receive a $35,000 settlement from the hospital. The couple had alleged they were denied proper medical treatment because they couldn’t fully communicate with hospital staff. Last month, St. Joseph Hospital in Nashua reached a similar agreement with the federal government, as did the city’s other hospital, Southern New Hampshire Medical Center, in July. St. Joseph also erased the $10,000 medical bill of two deaf people and their children after they had alleged the hospital and its medical practice umbrella, St. Joseph Physician Services, gave inadequate medical treatment because they didn’t provide ASL interpreters. SNHMC agreed to pay a hearing-impaired patient $5,000 following a similar allegation. Both Nashua hospitals agreed they would implement a program to ensure effective communication for deaf and hard-of-hearing patients, including access to ASL interpreters. Concord Hospital entered the same agreement in 2008. None of the four hospitals admitted liability. Farley said the U.S. attorney’s office is working with other hospitals on similar allegations, but declined to say how many. “This is not to just enforce the law, but to also educate about the importance of the ADA,” Farley said. And who settles is less important than how they follow and don’t follow the ADA, he said. JAIPUR, India -- The state government has decided to soon embark on the first- of- its-kind disabled persons' survey. It will try to identify and estimate all categories of differently-abled people in the state so as to help them take benefits of various government schemes. According to Aditi Mehta, principal secretary, department of social justice and empowerment, "The 2001 census records about 14.2 lakh differently-abled persons in the state. But only about 2.5 lakh of these are certified people with disabilities (PWDs) i.e. they have a certificate showing their disability. Therefore, a large number of government schemes for them remain unutilised. To help them derive benefits of these schemes the survey will be carried out." Mehta says the certified PWDs mostly include those from the urban areas and rural people rarely figure in it. This is the first comprehensive survey of such people not only in the state but in the country. Kerala is the only other state that has done a survey of the orthopaedically-challenged. The survey will be done in two stages. The first stage will involve identification of such persons for which the services of ANMs, Anganwadi workers and Asha workers will be taken. The field survey staff would be trained for the purpose and handed over questionnaires framed by experts. "The state has recently identified seven categories of PWDs, including those with locomotor disability, polio, cerebral palsy, mental illness, autism, mental disability, visual disability etc. "Many of these disabilities can be identified only by trained persons and for that we would be getting the help of doctors for training the field staff. After which a house to house survey will commence and we might take the help of NGOs too," she added. After the identification of the PWDs, they will be brought to a camp for certification by doctors. "In fact, the rules for a medical board before the certification of a PWD is done has also been changed for the better. Instead of the three-member board that used to be there earlier, it has now been changed to a one expert doctor. Here proper tests will be done and the certification will be conducted," Mehta said. In fact, the department is trying to ensure that the survey and identification is done soon so that the certificates can be given when the state government commences its "Prashshan Gaon Ki Aur" from November 10. "The effort is a commitment of the state government towards ensuring that social empowerment of one and all takes place. It is in keeping with the promise of chief minister Ashok Gehlot that all benefits of government schemes will filter down to the last person in the state," Mehta said. The Tuberous Sclerosis Alliance (TS Alliance) Oct. 30 announced the first drug approved for a tuberous sclerosis complex (TSC) indication by the Federal Drug Administration (FDA). This drug, manufactured by Novartis Oncology, is called Afinitor and will be used to treat subependymal giant cell astrocytomas (SEGAs) in individuals with TSC. This type of tumor develops in approximately 15-20 percent of individuals with TSC, and typically becomes symptomatic in children and adolescents, and rarely in adults. "SEGAs can be challenging for individuals with tuberous sclerosis complex and for the whole family, which is why we are encouraged to see ongoing research and new treatment options for these individuals," said Vicky Whittemore, Ph.D., TS Alliance Vice President and Chief Scientific Officer. "Prior to Afinitor the only treatment option for individuals with growing SEGAs, many of them children, was brain surgery." "At the TS Alliance, it's crucial for us to raise awareness about the tuberous sclerosis complex, as many individuals go undiagnosed or even misdiagnosed," explained Kari Luther Rosbeck, President and Chief Executive Officer for the TS Alliance. "Therefore, it's important that anyone with TSC get the care needed by having multiple treatment options available." "TSC research has moved from the identification of the genes for TSC in the 1990s to clinical trials in recent years, and the development of new treatment options for all of the symptoms of TSC is our priority," Whittemore continued. "This is the first treatment that has been approved by the FDA specifically for TSC, and Afinitor offers a new treatment option for individuals with the disease." The TS Alliance is the only national voluntary health organization dedicated to finding a cure for tuberous sclerosis complex (TSC) and improving the lives of those affected. TSC is a multi-system genetic disorder affecting many parts of the body, primarily due to the growth of tumors in the vital organs, such as the brain, heart, kidneys, lungs, eyes and skin. People with TSC commonly have epilepsy, behavioral disorders (such as attention deficit disorder-ADD), skin disorders (such as lesions) and other symptoms. TSC is estimated to affect nearly 50,000 people in the U.S., and more than 1 million worldwide. When choreographer Heidi Latsky told Lawrence Carter-Long (pictured) she wanted to work with him, he thought she meant in a public relations capacity. That's his expertise, after all. 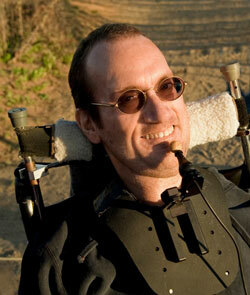 He's a popular speaker on a wide variety of topics ranging from disability issues to animal advocacy to media literacy. "I told her I was too busy, that I had more than enough on my plate," he said in a phone interview. "She said, ‘I don't need you for P.R. I want to work with you as a performer.'" Carter-Long has cerebral palsy and walks with a gait. "Heidi said, ‘I like the way you move. I can't move like that, and I would like to work with you,'" he said. She placed him and dancer Jeffrey Freeze, the associate director of her company, in a dance called "Two Men Walking," which compared and contrasted their movements. "We're more WWE than Martha Graham," Carter-Long said, jokingly. "We really throw each other around." The piece was a hit. So much so, the eight-minute dance has evolved into an entire show featuring other disabled dancers. Latsky's "The Gimp Project" will be on stage Friday night at the Lied Center for Performing Arts. The 75-minute dance concludes Latsky's residency in Lincoln with her company as part of the Interdisciplinary Arts Symposium at the Hixson-Lied College of Fine and Performing Arts. 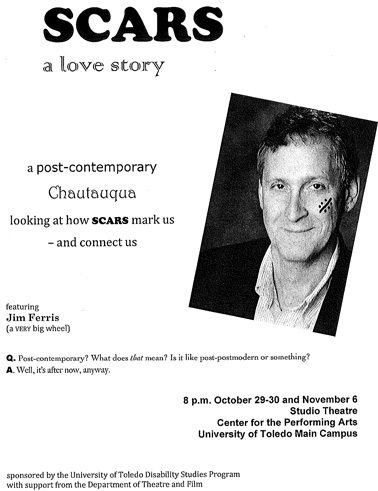 The symposium, organized by Rhonda Garelick, is in its second season. "Technology, Prosthetics and the Body in Performance" showcases artists who stretch, alter or question the limits of the physical body through technology. Latsky is a celebrated dancer and choreographer who received much acclaim as a principal dancer for Bill T. Jones/Arnie Zane Dance. She became a renowned choreographer through her collaboration with Lawrence Goldhuber in Goldhuber & Latsky. In 2001, she formed her New York-based modern dance company, Heidi Latsky Dance. She created "Gimp" in 2007, and Dance Magazine called it "without doubt a gleaming milestone in the progress of contemporary dance and theater, proving that the term ‘disabled dancer' is an oxymoron." "This has been incredible," said Carter-Long, who is the executive director for the Disabilities Network of New York City. "If you had told me three years ago I would be doing this, I would have asked what you were smoking and when can I get some. It was the furthest thing from my mind." "Gimp" has opened all kinds of doors for him and others with disabilities. Latsky uses the dance for workshops, outreach and community building. "You particularly can see (the effects) in (disabled) young folks who are 16 or 17," Carter-Long said. "They say, ‘Wow, I can do this' or ‘This is an option for me now.'" As it was for Carter-Long, who began dancing in his late 30s. "It's still kind of a kick to me when people say, ‘What do you do for a living?' and I say to them, in all honesty, ‘I'm a professional dancer,'" he said. "I watch how they react to that and try to make sense of that." 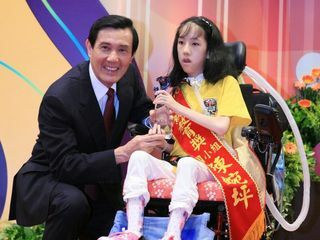 TAIPEI, Taiwan -- President Ma Ying-jeou (pictured) vowed Oct. 29 to help a 12-year-old wheelchair-bound girl make her dream come true by improving the country's barrier-free facilities. Ma said he instructed Transportation Minister Mao Chi-kuo to improve railway facilities first so that disabled persons could lead more convenient lives. Chen Wan-ping (pictured), who suffers from Nemaline Myopathy, a group of disorders that cause problems with the tone and contraction of skeletal muscles, expressed her aspiration in a letter to Ma written on July 30 before she received the 2010 Presidential Education Award. "My biggest dream is that barrier-free facilities can be available everywhere in Taiwan, " Chen wrote in the letter, which she was not allowed to present to the president at the award ceremony but which later reached Ma. Speaking at an anniversary celebration of a Taipei elementary school, Ma said he was deeply moved by her passion for life and "I made my promise and she has my word now." "Once I had learned to write with my feet, I knew I could take on anything," says Huang Yangguang (pictured), who at the age of five lost both arms in an accident involving high voltage electrical wires near the family orchard in Guangxi province, China. The 32-year-old one-time farmer, now a lead dancer for the China Disabled People’s Performing Art Troupe, recounts through an interpreter how his teacher excused him from taking notes while at primary school. It made him even more determined and by the age of eight, he’d mastered writing and painting with his feet, a task that "wasn’t easy," he says. Next month, Mr Huang will travel to Australia after fulfilling yet another seemingly impossible goal: to become a professional dancer. 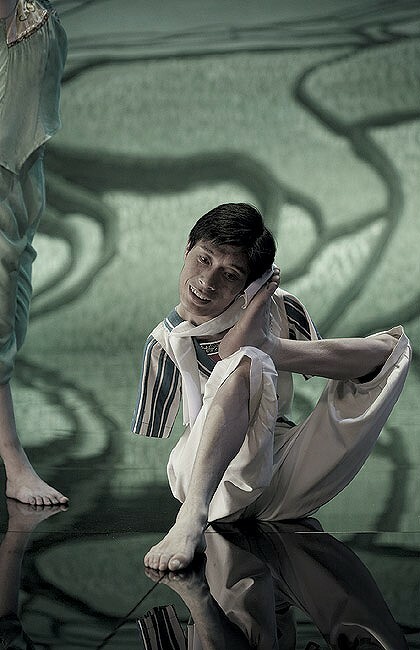 Mr Huang carried his childhood determination into adulthood, continuing his quest for independence by entering a competition held by the disabled troupe nine years ago. The spirited young man says at the time, he really had no inkling if he actually could dance but was encouraged by a local teacher to give it a go. He was accepted into the troupe, which now provides him with a home at its Beijing training centre, rehabilitation, education and most importantly, a career. Today, Mr Huang feels “ very, very happy” when dancing and has joined the troupe on several international tours, performing the self-choreographed piece The Happy Life in Farmland. He’s happily left behind the fruit picking, tree grafting and watering of his old life. "From rural beginnings, I now live in a big city as a professional dancer and am completely independent,'' he says. When founded in 1987, the troupe politely declined the offer of government funding, wanting instead to remain independent on the road to commercial success. There are currently three separate troupes touring the world and 110 artists who live at the training centre. And at least one Australian can’t wait for the troupe to arrive. "Bring it on," says Victorian disability advocate John McKenna. "This is fantastic because it builds on what we are trying to achieve in Australia in regard to being an inclusive society. The troupe is reinforcing a global focus on making life better for those with disabilities”. KANSAS CITY, Kan. -- Right now, the Kansas legislature has the authority to prohibit someone with a mental illness from voting. Nov. 2 voters will decide whether or not to change that. Constitutional Amendment Question No. 2, as it's called, has not met much formal opposition, but proponents say a victory would still be extremely significant. Kansans with mental illnesses have been voting without state constitutional protections for decades. It was no big deal. Until about two years ago, when Rocky Nichols, director of the state's disability rights center, was working on a case involving the voting rights of a client with an intellectual disability. "And I said, well, let me check the constitution. So I went to the suffrage provision and read it, and found out that there's no prohibition for a person with an intellectual disability, but there is a potential prohibition for a person with a mental illness," says Nichols. "And it just hit me like a ton of bricks. I was just shocked." Nichols says what ensued after sharing what he learned with others in the mental health community was a groundswell of support to try and eliminate the prohibition. The campaign's been largely funded by the health care foundation of Kansas City, which underwrites health reporting at KCUR. Kansas is not the only place that includes such language about mental illness in its books. And a century ago, referring to people as idiots or insane within areas of voting restrictions and other legal issues was the norm. In fact, the Kansas legislature removed that language from article five in the mid seventies, but then replaced it with the term mental illness. Still Lewis Bossing, a senior attorney at the Bazelon Center for Mental Health Law, says in recent years, many states and the federal government have been moving away from statutes that exclude general groups of people - like those with disabilities - from voting. "As a country, we're moving toward a recognition in our voting laws that people with mental illness should have the same right to vote that everyone else does," says Bossing. "It's a crucial distinction to note that for the most part, people with mental illness at most times are capable to make a choice. And for state governments to take away that right based a categorical blanket kind of concern about the impropriety of voting or some voter irregularity is simply a form of discrimination. There are a lot of people without mental illness who come into the voting process without a lot of information or perhaps without having given it a lot of thought. I don't think there's a reason to classify people with mental illness as having harder times making the choice than anyone else does." To date, Kansas has not actually acted on its authority to prohibit people with mental illnesses from voting. Bossing says with the passage of legislation like the Americans with Disabilities Act, courts would likely overrule any attempt to do so. That happened several years ago in Maine, after voters twice rejected a measure to amend similar language in their state's constitution. Local advocates say they still view the language as a potential threat here, and concerns over public perceptions of the issue have many out this campaign season. Cherie Bledsoe (pictured) faces a crowd of about seventy five at an Amendment Two rally in Overland Park. She says she's struggled with mental illness but, has gotten help and since recovered. She now directs a consumer organization and says it's crucial for the state to clean up the threatening language of the constitution. "It stigmatizes those of us with mental illness. 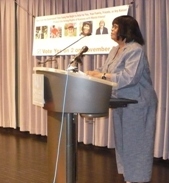 It furthers the discrimination, the disrespect, fear and misunderstanding that surrounds mental illness," says Bledsoe. "It gives a false impression of our capabilities and makes assumptions that paint a negative picture of people with mental illness." Mark Wiebe, the rally's M.C., and director of public affairs at Wyandot Center, tells the crowd the issue is one that directly and indirectly affects just about everyone. "Mental illness can strike anyone at anytime," says Wiebe. "Consider this: one in five Kansans can be expected to have a mental health disorder in a given year. That comes to more than half a million Kansans. It includes people with post traumatic stress disorder and many other disorders. Think about that last illness, PTSD. It can affect anyone who experiences a traumatic incident, but it's most often associated with victims of sexual assault and soldiers returning from combat." Weibe says the constitution's language is of another era, when people didn't know what they do today about mental health. He sees the change as part of a larger shift in the way society views and cares for people with mental illness. Whether or not others see it that way, has yet to be determined...at least until next Tuesday, when Kansans take to the voting booth. LIBERTY TWP, Ohio -- Kurt and Kristen Feldmann won't have to drive to Mason anymore to find a handicap accessible playground for their wheelchair-bound son Konrad. Newly installed playground equipment at Dudley Memorial Park will allow his 9-year-old sister Kathryn to push him up a concrete ramp onto a large piece of equipment. It is one of several pieces purchased with a $100,000 Community Development Block Grant. "Throughout Konrad's life he hasn't been able to walk or run or talk or even play like other children," his father, Kurt, said. Konrad's cerebral palsy left him non-verbal and with limited use of his arms and legs. "This is an incredible place to play that reduces barriers and lets him play like other children," said Feldmann, who sits on Liberty Township's Parks Committee. "Ninety percent of this is accessible to Konrad." His comments came Friday during a ribbon cutting ceremony for the newly installed equipment. It replaced older, non-handicap accessible equipment that no longer meets playground safety standards. In the past year, similar equipment has been installed in parks in Colerain Township and West Chester Township's Beckett Park. The new equipment was put together and installed by township workers in a 75-foot by 75-foot area of the 11-acre park. It sits on 12 inches of mulch adjacent to both the parking lot and covered shelter, said Jon West, the township's director of planning and zoning. West was part of a team of township officials that put together the grant and ordered the GameTime equipment in consultation with Bob Greiwe, who specializes in playground equipment. "I believe this park will be one of the more popular ones. There are not many blind spots for children to hide in," Feldmann said. "Children don't know it's safe; they just know there's a lot of great playground equipment." Konrad's sister Kathryn gave the playground two thumbs up after pushing her brother onto the equipment. "He's heavy," she said with a smile. A survey commissioned by the Emily Hall Tremaine Foundation of New Haven exposes poor understanding among many Americans of what causes learning disabilities. Fifty-five percent of parents and 55 percent of the general public surveyed agreed that learning disabilities are "often caused by the home environment children are raised in." About 51 percent of those surveyed agreed that "sometimes learning disabilities are really just the result of laziness." I think we education writers, particularly me, need to take the blame for much of the ignorance. We rarely write about learning disabilities. The subject is complicated. The research is hard to understand. There are no sure cures, and few success stories, which makes editors unhappy. There are plenty of political and legal battles over special education programs for children with learning disabilities, but they are usually about money, not about the best way to help students. When we do write about disabilities, we often get mail from grateful families. But that doesn't seem to inspire more effort. The Tremaine Foundation poll has some rays of hope. The portion of respondents who think some disabled kids are just lazy has declined from 57 to 51 percent since 2004. That isn't much, but it's better than nothing. GARDENDALE, Ala. -- A Gardendale mother and father were arrested Oct. 26 and charged in connection with their toddler's death. The little boy, who had Down syndrome, died in April. Since then, Gardendale Police have been investigating. The parents, Jeffery and Rebecca Stockton, were indicted by a grand jury Oct. 26 for starving their child to death. They were arrested on charges of manslaughter and taken to the Jefferson County Jail. They were held on bonds of $30,000 each. Authorities say in April, 16-month-old Justin Stockton died from severe malnutrition. And a month later, 8 children were taken from the home and placed in DHR custody. Authorities and the district attorney wrapped up an investigation into the child's death two months ago, which has now led to the parents indictments and arrests. FOX6 spoke to a woman who knows the Stocktons, but didn't want to be identified. She says hearing the arrests for manslaughter of their 16-month old little boy was disturbing. She says they lived a different lifestyle and had an unusual way of raising their children. "There have been lots of events and things that have happened over the years that were not normal," said the woman. "The family is very strange." Around 6,000 disabled people have volunteered to help at London 2012. Britain's most successful Paralympian says it represents a huge change in attitudes from when she first started to compete. London 2012 organisers have dubbed them the Games Makers: the volunteers who will make the Olympics and Paralympics a reality. Seventy thousand are needed to carry out tasks - from sewing sequins for the opening and closing ceremonies to welcoming athletes to their temporary homes. London 2012 is less than two years away. The deadline for applying to volunteer is just a few hours away - organisers will stop taking applications at midnight on Wednesday 27 October. At the last count more than 100,000 people had put themselves forward including 6,000 disabled people. Britain's most successful Paralympian, Dame Tanni Grey-Thompson (pictured), says the number of disabled applicants is very encouraging: "It just shows how comfortable they are with the process and how much they want to contribute, because we want to show the whole world that London is a very diverse city. "Everybody, it doesn't matter who you are, has something to contribute towards being a volunteer in London 2012." Some previous Paralympic Games have been under-represented in terms of volunteers. Out of the 70,000 volunteers required for the 2012 Games overall around 23,000 will work at the Paralympics. Dame Tanni is confident there won't be a shortage of people putting themselves forward this time: "I think what's happened in the past is that the Paralympics has been something that's come after the Olympic Games. "With London 2012 it's always been an Olympics and a Paralympics alongside each other and that's why the volunteering programme has been run together...and that's really exciting because London will put the Paralympics on a whole new level, not just in terms of athletic performance but also in terms of the way the Games are organised and run. "What we want really is for people to volunteer for both the Olympic and Paralympic Games...it's really important we get the right number of volunteers for the Paralympic Games to make sure they run smoothly." Speaking earlier this month, Lord (Sebastian) Coe, Chair of the London 2012 Organising Committee said: "We are thrilled with the response we've had so far from people and would like to thank everyone who has already filled in their application form and pledged to lend their time to the greatest show on earth. "The London 2012 Games simply could not happen without volunteers. Whenever I have spoken to previous volunteers, they've all said what a fantastic experience it was." 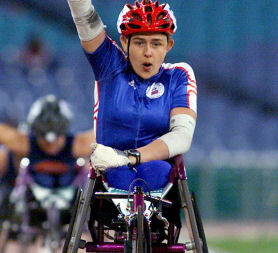 Dame Tanni Grey-Thompson has won 11 Paralympic gold medals, making her Britain's most successful Paralympian to date. She told Channel 4 News that the profile of the Paralympics had risen remarkably over the years: "There's been a huge change in attitudes. My first Games was 1988 and nobody really knew the term Paralympics - it was the first time it was used. "Seoul was interesting, Barcelona pushed it on, but by the time we got to Beijing in 2008 it had changed out of proportion in terms of how hard the athletes were training, the level of sponsorship...But 2012 will set the bar higher than it's ever been before. I'm very excited about that because it will be a lot for any other city which hosts a Paralympic Games to live up to because London is going to be amazing." WASHINGTON, D.C. — People who are blind from birth are able to detect tactile information faster than people with normal vision, according to a study in the Oct. 27 issue of The Journal of Neuroscience. The brain requires a fraction of a second to register a sight, sound, or touch. In this study, a group of researchers led by Daniel Goldreich, PhD, of McMaster University explored whether people who have a special reliance on a particular sense — in the way blind people rely on touch — would process that sense faster. "Our findings reveal that one way the brain adapts to the absence of vision is to accelerate the sense of touch," Goldreich said. "The ability to quickly process non-visual information probably enhances the quality of life of blind individuals who rely to an extraordinary degree on the non-visual senses." The authors tested the tactile skills of 89 people with sight and 57 people with various levels of vision loss. The volunteers were asked to discern the movements of a small probe that was tapped against the tips of their index fingers. Both groups performed the same on simple tasks, such as distinguishing small taps versus stronger taps. But when a small tap was followed almost instantly by a larger and longer-lasting vibration, the vibration interfered with most participants' ability to detect the tap — a phenomenon called masking. However, the 22 people who had been blind since birth performed better than both people with vision and people who had become blind later in life. "We think interference happens because the brain has not yet completed the neural processing required to fully perceive the tap before the vibration arrives and disrupts it," Goldreich said. "The more time between the tap and the vibration, the more formed the perception of the tap will be, and the less interference the vibration will cause." The authors measured the minimum amount of time needed for participants to perceive sensory input by varying the period between the tap and the vibration. They found that congenitally blind people required shorter periods than anyone else. Those same individuals also read Braille fastest. The authors note that each blind person's perception time was approximately equal to the average time that person took to move a finger from one Braille character to the next as they read. The findings suggest that early onset blindness leads to faster perception of touch. However, whether that advantage is due to the brain adapting to the absence of vision — a change called plasticity — or to a lifetime of practicing Braille is still unclear. Richard Held, PhD, of Massachusetts Institute of Technology, an expert in the brain and visual development who was unaffiliated with the study, said the results suggest that a lack of visual experience changes how information acquired by touch is processed. "The heightened skill of tactile integration seems to account for the remarkable speed of Braille-reading demonstrated by some congenitally blind individuals," Held said. "This work constitutes a solid step forward in our understanding of the interaction between senses." A new study has brought scientists closer to solving one of the many mysteries of multiple sclerosis and other demyelinating diseases. The research by the Salk Institute for Biological Studies has revealed a previously unknown connection between two ion channels, which, when misaligned, can cause the many bizarre symptoms that characterize the condition. The findings have provided fresh insights into the mechanisms underlying MS and suggest a novel target for therapeutic intervention. "We've discovered a new target that could be efficacious. This particular pathway or ion channel is a key player in this disease, and we think that manipulating it could have a huge benefit for people suffering from MS," said Terrence J. Sejnowski of the Howard Hughes Medical Institute, who led the study. Multiple sclerosis is a chronic, often disabling disease that attacks the central nervous system; it is responsible for a baffling range of neurological symptoms, including numbness, tingling, muscle weakness, paralysis, and vision loss. It is thought to result when the immune system attacks the myelin sheath that insulates axons, the nerve fibres that conduct electrical impulses to and from the brain and between neurons within the brain. Ordinarily, the myelin speeds up the signals the axons transmit, called action potentials. When axons lose their insulation, however, either signal conduction fails because the demyelinated axons are unable to generate an impulse, resulting in a loss of sensation, weakness, or blindness, or the axons become hyperexcitable and overcompensate by firing even in the absence of an input, causing twitching. The first computer model of axonal transmission, developed in the 1950s for the giant axon of the squid, which lacks myelin, tracked positively charged sodium and potassium ions, whose movements across the neuronal membrane generate the necessary electrical signals. Building on that model, Sejnowski and his team included myelin in their own model, then demyelinated one of the sections and incorporated all the changes known to take place as a result. "It's been known for a long time that the two most important ions in the axon are sodium and potassium. What we did was use a program that can model every part of the axon by breaking it into little segments so we could we keep track of the ions going in and out of each segment. And what we found really surprised us," said Sejnowski. The vast majority of prior clinical studies had focused on the sodium channel, which is responsible for initiating the action potential, and many of the targets for MS drugs likewise focus on the sodium channel. While enhancing the sodium current did boost the signal in Sejnowki's model, it was the ratio of densities between the sodium channel and a previously ignored but ubiquitous voltage-insensitive potassium current called the leak current, which sets the ground state of the neuron, that determines whether neurons can fire properly. If the sodium level drops, an accompanying drop in the leak current will maintain the signal, whereas if the sodium drops but the leak current doesn't, signal transmission may fail. Conversely, if the sodium level is too high and the leak current doesn't increase, a patient may experience twitching. The "safe" zone lies between the two limits. The findings were reported in the Proceedings of the National Academy of Sciences (PNAS). Scientists studying swine flu have found that 70 children died from it in England in a 9 month period during the H1N1 pandemic and death rates were worst among ethnic minority children and those with other health problems. In a study in the Lancet medical journal, Liam Donaldson, the former Chief Medical Officer for England, said children from the country's Bangladeshi and Pakistani communities had much higher mortality than white British children, as did children with serious pre-existing illnesses -- especially chronic neurological diseases such as cerebral palsy. These high-risk groups should be a priority for H1N1 vaccination, Donaldson and his research team said. According to the World Health Organization (WHO), which declared the pandemic over in August, some 18,450 people worldwide are confirmed to have died from H1N1, including many pregnant women and young people. But the WHO says it will take at least a year after the pandemic ends to determine the true death toll, which is likely to be much higher. Experts say H1N1 swine flu virus has now taken over as the main seasonal flu strain and health authorities that run annual flu campaigns have included it in regular seasonal flu vaccines. Donaldson's team said their findings of high death rates among ethnic minorities were consistent with reports from the United States of minorities suffering more severe illness during the H1N1 pandemic. "This finding might be attributable to clustering of pandemic influenza A H1N1 cases in areas of England with high ethnic minority populations -- such as London and the West Midlands," they wrote in their study. * The overall childhood death rate for H1N1 was 6 per million population. * The rate was highest for children aged under 1 year, at 14 deaths per million population. * Death rates were higher for Bangladeshi children (47 deaths per million population) and Pakistani children (36) than for white British children (4). * Of the 70 children who died of H1N1, 21 percent were previously healthy and 64 percent had severe pre-existing disorders. * Overall, 45 of the children had received the antiviral flu drug oseltamivir, sold under the brand name Tamiflu, but only seven had had it within 48 hours of the onset of their symptoms and only three had it before they were admitted to hospital. * Only two of the children who died had received an H1N1 vaccine -- too late for it to be effective. A $2.3 million federal grant will be used to support a four-year program to help adults with learning disabilities have a college experience at the College of Charleston. The U.S. Department of Education awarded the grant to help fund the Realizing Educational and Career Hopes: Foundation, Augmentation, Replication program. The program at the College of Charleston is a new post-secondary program for adults with intellectual disabilities who want to be included in the academic, professional, residential and social college experiences in a supportive environment, the college said in a news release. “We view this as an extraordinary opportunity for the college to establish itself as a national leader in inclusive education and to promote inclusion not only at the post-secondary level, but also at primary and secondary levels as well,” said Cynthia May, a professor in the psychology department at the College of Charleston. The money will be used to extend the core foundations of the Reach Far program, the college said. This includes collaborations with regional educational and professional organizations, promotion of positive attitudes toward disability, and improved student preparation, recruitment and retention. The program, which enrolled its first students in the fall, offers credit and non-credit programs to students whose quality of life and opportunities to contribute to society hinge on access to educational opportunities, the college said. Money for planning and development of the program came from a College Transition Connection grant. STAMFORD, Conn. -- The New York woman who used forged credentials to fleece more than $150,000 from families with autistic children and the Norwalk school system was sentenced to three years in prison Oct. 28. Stacy Lore, 34, formerly of Carmel, N.Y., was given an eight-year prison sentence that will be suspended after she serves three years, followed by five years of probation. She is accused of posing as a board certified behavior analyst and told Norwalk school officials she had two master's degrees and a doctorate so she could work for the public school district as a consultant on autism treatment services. Victims of her scams said they paid her tens of thousands of dollars in exchange for what they though was specialized treatment for their autistic children. One such parent, Kim Graham, said she uncovered the fraud after moving her high-functioning son to another specialist who had real-life qualifications and effective therapies. She became suspicious and checked the online registry for the Behavior Analyst Certification Board. She could not find certification records for Lore. It took months for school and police officials to act, she said. Using her forged credentials and a company named Spectrum Kids, Lore billed the Norwalk school system $155,000 for services to children with autism between 2007 and 2008, records show. Families of the special-needs children whom Lore treated without any qualifications spoke out in court in the moments before Judge Richard Comerford handed down the sentence. All of them urged the court to punish Lore with the maximum amount of prison time allowable, arguing her lack of qualifications with autism treatment stunted the development of their children. They called her a monster, liar and manipulator and said she bought a black Mercedes with the money she made by posing as an autism treatment specialist. Margaret Bustell, of Norwalk, told the court she confronted Lore when she realized the scope of her fraud. At the time, Lore defended herself and showed her falsified credentials and advanced degrees from New York University. In reality, she only had a 1993 high school equivalency diploma from New York state. "They were real children with real problems, and we needed real solutions," Bustell said, choking up at points while reading her statement to the court. Defense attorney William Pelletreau, of Norwalk, said Lore made no excuses for her crimes and urged the court to accept the recommended sentence of a three-year suspended prison term, saying it was a case that "screams for" psychiatric treatment. Before handing down the prison sentence, Comerford expressed doubts that Lore was remorseful for her crimes. He also cast blame at those responsible for allowing Lore to pose as a certified behavior analyst for so long. "There are more people responsible for this than are in this courtroom today," Comerford said. Bustell said families of the children affected by Lore's fraud plan to sue the Norwalk school district. Attorney Greg Kimmel is representing four families in a civil action against Lore and the city of Norwalk that he plans to file in the next few weeks. Lore has been charged by Weston authorities on similar accusations and is also the subject of an investigation in New Fairfield, prosecutors said Thursday. John T.C. Yeh (pictured), owner of Rockville deaf services company Viable, and his brother, former Viable executive Joseph Yeh, pleaded guilty Oct. 28 in a federal court in Trenton, N.J., to conspiracy to commit mail fraud. Authorities said the Yehs conspired to defraud the Federal Communications Commission's Video Relay Service program, which helps deaf people communicate, by paying others to make fraudulent calls. They submitted some $55 million in claims to the FCC, according to a news release from prosecutors. John Yeh, 63, and Joseph Yeh, 65, who previously pleaded not guilty to the charges, appeared before U.S. District Judge Joel A. Pisano after signing a plea agreement under which other charges would be dropped. At their sentencing, scheduled for Feb. 9, they each face a maximum sentence of 20 years in prison and a fine of $250,000. Paul Kemp, a partner with Ethridge, Quinn, Kemp, McAuliffe, Rowan & Hartinger in Rockville who is representing John Yeh, and Stanley Reed, a principal with Lerch, Early and Brewer in Bethesda who is representing Joseph Yeh, could not be reached for comment Thursday. The Yehs were indicted almost a year ago, two of the 26 people nationwide charged with conspiring to defraud the FCC program. At least 11 other people, including former Viable executives Anthony Mowl and Donald Tropp, pleaded guilty during the past year. In court documents filed this week, the Yehs said they were "presently unemployed." John Yeh has long been involved with organizations that advocate for the deaf community, such as the National Asian Deaf Congress and National Deaf Business Institute. He was a trustee of Gallaudet University, a Washington, D.C., institution that specializes in education for deaf people, for more than a decade. Deaf Life, a monthly national magazine founded in 1987, honored him as Deaf Person of the Year in 2008. 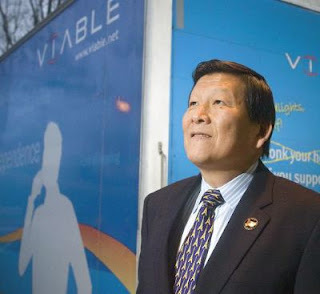 A previous business that John Yeh formed, software engineering and integration company Integrated Microcomputer Systems, in Rockville with the help of his brothers, reached $40 million in revenue in 1995 before he sold it in 1996. Snap!VRS of Pearl River, N.Y., a video relay service company, agreed to acquire Viable last year. But that transaction has been pending, as officials wait to see what occurs with Viable's legal situation. HOUSTON -- Dealing with the city’s growing mentally-ill population is, without a doubt, one of the most difficult jobs facing the Houston Police Department today. HPD says funding, which provides help for Houston's mentally ill, has been on the decline for years. The result has meant more 911 calls asking for police assistance. The 11 News I-Team witnessed this firsthand by riding along with HPD for a couple of days. No one knows the situation Harris County is facing better than Dr. Stephen Schnee, the executive director of The Mental Health and Mental Retardation Association. But every month, MHMRA in Harris County gets an additional 400 to 500 people referred to them, he said. And right now, more than 160,000 people need psychological help. “I believe the system is really flawed because we are treating these conditions, these serious conditions as short-term conditions,” Schnee said. Until recently, many of these patients ended up in the Harris County Jail. There are currently more than 2,500 mentally ill people being held there. But the trend to lock them up is slowly changing. HPD has teamed up with MHMRA and formed a unit called CIRT. It stands for the Crisis Intervention Response Team. It's just a start, but right now the department has seven trained officers on the streets. Each officer is joined by an MHMRA clinician. A clinician is armed with a laptop and a master’s degree, which enables them to check medical histories and guide the patient to the best possible care available at that moment. Riding along with the team for several days was an eye-opener. We learned the unit can be dispatched all over the city. The officers often race to suicide threats or calls involving some of the city’s homeless. “When's the last time you had anything to eat?” Sgt. Patrick Plourde asked a man who said his name was T.J.
T.J. seemed to be hearing voices and was delusional. “He doesn't have any identification. He says Satan took it away from him,” said Officer Joe Olsen. Since CIRT started a few months ago, it has taken more than 1,100 mentally ill patients to Ben Taub’s Psych Unit. “The officers right now that are working full time have the patience of Job,” one officer said. And nobody appreciates that more than Debra Jameton, who called police to report that her mother had attacked her and was out of control. Police responded and transported her schizophrenic mother to Ben Taub. “They are the only one that seems to understand what is going on you know. They come in because they've done the training for all this,” said Jameton. The mental health squad will not solve all the problems of Houston's mentally ill, but it is making a difference. We learned they are doing their best to protect all of us and the patients who often want to hurt themselves. Blind Café returns to Boulder, Colo.